Chris - When Neil Armstrong and Buzz Aldrin brought back the first samples of Moon rock in 1969, scientists were surprised to see tell-tale signs in material that the Moon had once had a magnetic field - a bit like the one that we have on Earth today. They thought that this magnetic field was created by geological processes that were occurring while the Moon was still hot from its birth, but that these had stopped once it had cooled down. Now though, another look at one of those 1969 samples has revealed something very unexpected. Erin Shea from MIT made the discovery. She is with us now. Hello, Erin. Chris - So what is it you found? Erin - What I found was that 3.7 billion years ago, the Moon had a very strong, stable and long-lived magnetic field - like you said, similar to what the Earth has today. Chris - If we wind back through the Moon's history, we think it's about the same age as the Earth - give or take - and it was formed by some catastrophic collision between Earth and an Earth-sized planet that then ejected all this material into space. So, is the Moon therefore effectively a mini Earth in orbit around the Earth? Erin - In a lot of senses, the Moon and the Earth have a lot in common. They both have these metallic cores. On the Earth, thankfully, it's still going strong and producing our magnetic field. 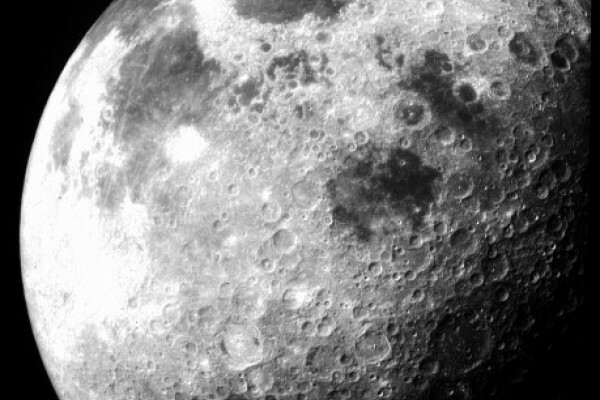 On the Moon, it seems like it died out several billion years ago. Chris - But grossly, the mechanism that produces the magnetic field, we think would probably be similar, because the Moon has effectively spawned from the Earth. Erin - Initially, we thought that if the Moon ever did have a magnetic field caused by a dynamo, which is what generates the magnetic field on the Earth, that dynamo would have the same power source on the Moon as it did on the Earth. What our study has just shown though is that the dynamo on the Moon lasted far longer than we would've expected it to if it had the same power source. On the Earth, the dynamo is driven by cooling. Basically, as the metal cools down, it convects the metallic core and that generates a magnetic field through some complicated physics. On the Moon though, we would've expected the Moon to cool off long ago, 4.2 billion years ago approximately. So seeing evidence for a magnetic field 2.7 billion years ago really kind of puts the alarm bells out that something other than cooling must've generated the moon's dynamo. Chris - There's no way that you could've miscalculated or - I don't mean you, personally, but the scientific community could've miscalculated the rate of cooling for the Moon and that in fact, it is the same processes we have on Earth, it just took longer for the moon to cool down and therefore it kept its dynamo for longer? Erin - Well, as a scientist, you can never say never, but I think it's rather unlikely that we misjudged this calculation. We know how much heat producing radioactive elements the Moon has, we know how big the Moon is, and so, from there, we can actually do this calculation. So probably not, but I would never cross that completely off the list. Chris - So how did you actually do the study? You got your hands on a piece of material that Buzz Aldrin and Neil Armstrong brought back with them from 1969. I bet they don't come along every day. Erin - No, it was like a dream. You apply to NASA and tell them what you're going to do with the sample and then they allocate you a given amount. We got one gram of lunar sample 1OO20, and we cut this into small pieces and measured the magnetic field on each of those pieces. We knew their orientation relative to each other, which is important for the measurements that we were doing. Chris - So you can tell that there's a magnetic field written into that rock. How did it get there then? Erin - There are lots of ways that rocks can acquire magnetic fields. On the Earth, when lava erupts, it can acquire a magnetic field from the Earth's magnetic field because you know, that's the reason that our compasses work. Then that rock could get hit by lightning and then it would get another magnetic field. On the Moon, there's a whole different set of sources. So, we have possibilities that lava was erupted onto the surface of the Moon and it cooled down in the presence of a magnetic field generated by a dynamo, and that would produce one set of characteristics. Another set of characteristics would be produced if there was a big impact and a magnetic field was produced by that impact. When we picked that sample up, it spent about 3 days riding back to the Earth on a spacecraft with DC current which also generates a magnetic field. It then spent 4 years sitting on the surface of the Earth in the presence of the Earth's magnetic field. There are all these sources and then lots and lots of different things in addition to that, that could've given this rock the magnetic field, and what we've shown is that this sample actually erupted as a magma. It was hot and then as it cooled down, it locked in a magnetisation that it seems was from a lunar dynamo, which is awesome. Chris - So it's a time capsule effectively tracing a snapshot in time of the Moon's early history and recording the existence of this magnetic field a long while after we would've expected it to have gone away. Can you speculate for us as to how that came along? How did it come about? What could've caused this? Erin - What could've caused this dynamo on the Moon? Obviously, we just talked about cooling and you're right, we don't know for sure. But we're pretty sure that the Moon would've been cooled by 3.7 billion years ago. There were two papers written and published in Nature in December that talked about different ways that you could've generated a lunar core dynamo. One of which was that the Earth of mechanically mixed the lunar core, the gravity of the Earth forced that around. This is really neat to think about because 3.7 billion years ago, the Moon was actually much closer to the Earth, so would've had a much bigger effect. The other paper was about large impacts, because when you look at the Moon today, you can tell that it's experienced a pretty rough history. There are lots of craters on the surface and what these people hypothesise is that maybe large impacts served to stir that lunar core and generate a dynamo. Chris - And finally, does it have any implications for the Earth? It's one thing to worry about the moon where no one lives, but we live and die by our magnetic field. What about life on Earth? Does it tell us anything about the magnetic field here? Erin - What it might tell us is, what does a magnetic field look like when it dies off? That's something it could tell us. And then also, what started this on the Earth? What was the Earth's early history like because if the Moon is full of craters then the Earth must've been bombarded with craters too. And so, what effect would that have had on the Earth's magnetic field and its early history?